Public sector undertakings are lagging far behind the private sector in implementation of hydroelectric projects which are being delayed. While most of the private sector projects, which were to be commissioned by December 2010, have spilled over into 2011, those being implemented by state and central public undertakings have fallen behind schedule by 18 to 36 months. Tension gripped Jawalamukhi Degree College today when the NSUI held a protest demanding that the college, which was being run by the Jwalamukhi Temple Trust, should be taken over by the government, a principal be appointed and proper infrastructure in both arts and the science blocks be set up. 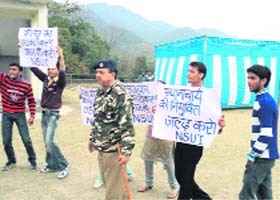 NSUI activists protests in Jwalamukhi Degree College before the clash. About 10 per cent cops on traffic duty in the lower areas of the state are suffering from respiratory or other health problems. The facts have been brought out by a study conducted by Dr Rupali Parlewar Fulzele, associate professor in the department of physiology at Tanda medical college. 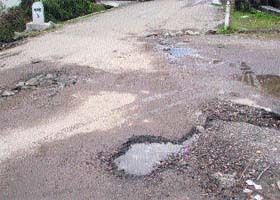 Leaking pipes of the Irrigation and Public Health (IPH) Departments were causing losses worth lakhs of rupees to the Public Works Department (PWD) in Palampur town every year as most of the roads recently metalled by the PWD have developed big potholes on over 60 points in different parts of the town. The BJP will oppose the move to amend the Multi-State Cooperative Societies Act and bring cooperative institutions in the income tax net as proposed in the Direct Taxes Code. The Himachal Power Engineers Association has reiterated its demand that the post of chief engineer, looking after the planning and monitoring, in HPSEB Limited should be manned by an electrical engineer and asserted that after unbundling of the state utility there was no justification for appointing a project engineer. A three-day Golden Jubilee Ski Cup-2011, organised by the Atal Bihari Vajpayee Institute of Mountaineering and Allied Sports, Manali, on the completion of 50 years of this mountaineering institute, has concluded at Solang ski slopes, 13-km from here. Over 450 complaints and demands relating to different government departments appeared in the ‘Prashasan Janta Ke Dwar’ programme organised at Fatehpur in the Jawali subdivision under the chairmanship of Chief Minister PK Dhumal out of which 250 cases were settled on the spot and remaining were forwarded to the authorities concerned for expedite action. The Himachal Tourism’s much-hyped heli-taxi services on the Shimla-Kullu-Manali route proved to be a failure. The Department of Tourism could not operate even a single sortie on the route since the inception of the service on January 29. The Himachal Pradesh Employee Confederation has urged Union Finance Minister Pranab Mukherjee to raise the income tax exemption limit to Rs 2,50,000 from the present Rs 1,60,000 in view of the high rate of inflation. The Himachal Government Teachers’ Union has urged the Chief Minister to amend 1998 Recruitment and Promotion (R and P) rules for school headmasters. In a statement here today, state general secretary of the union Onkar Rana said enforcing of these rules adversely affect the interests of the Trained Graduate Teachers (TGTs) working in government schools. The HP State Employment Directorate will organise an “Employment Mela” in collaboration with the Industrial Association at Parwanoo on February 22 at 11 am and all those 409 unemployed youth of Bilaspur district, who are qualified in Diploma or VSC from ITI/Polytechnic in machinists, electrician, turner, welder, fitter, mechanical, electrical, electronics diploma holders and B.Sc, B.Com can participate in this mela. The inquiry instituted by the Forest Department into the seizure of 281 deodar sleepers by the Vigilance on Friday is being viewed as a cover-up exercise to save its skin. It found the forest field staff had colluded in the illicit timber case and asserted that it would fix responsibility in which six accused were in police remand. A State Vigilance and Anti-Corruption Bureau (SVACB) Mandi team arrested Rohit Kumar with unaccounted jewellery of Rs 50 lakh at Mandi on Saturday. The bureau said Rohit had been spotted in the town for the last two days and the team was keeping a vigil on him. The intense cold wave sweeping Himachal Pradesh continued today with chilly winds blowing across the region. The minimum temperature dropped to 1.7°C and 2.2°C in capital Shimla and Solan, while Sundernagar, Bhuntar and Dharamsala recorded a low of 4.8°C, 3°C below normal. A local non-governmental organisation (NGO), Umang Foundation, organised a blood donation camp to mark the birth anniversary of Guru Ravidas, here today. As many as 55 persons donated blood in the camp. Even after the revised completion schedule, only about 1550 MW capacity will be added during the current year as against about 3,000 MW due to inordinate delay in the implementation of the public sector projects. The largest hydroelectric project in the private sector, 1000 MW Karcham Wangtu on the Sutlej, is all set for commissioning and the first 250 MW unit is expected to become operational by March, while all four units will be commissioned by June. The 192 MW Allain Duhungan, one unit of which is already functional, will also be fully commissioned during the current year. Other private projects to become operational during the year are 100 MW Malana-II and 70 MW Budhil. However, the only major public sector project to be commissioned this year is 231 MW Chamera-III which was to be completed in August last year. As per the revised schedule, the project being executed by the NHPC will be commissioned by June. The NTPC’s 800 MW Kol Dam, which was to be originally commissioned in 2009, has fallen far behind the schedule and may take more than two years. Similarly, the 100 MW Uhl project being implemented by the state electricity board is also not likely to be completed this year as scheduled and likely to take two more years. The 412 MW Rampur project being set up downstream the Nathpa Jhakri project by the Sutlej Jal Vidyut Nigam has also fallen behind by about two years and as per the revised schedule, it will be competed only by 2015-16. 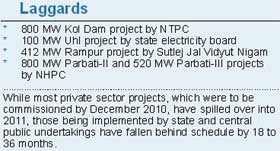 The 800 MW Parbati-II and 520 MW Parbati-III projects being set up by the NHPC have also fallen behind schedule and they will be commissioned in 2013. The addition of over 1500 MW hydro capacity will improve availability of power in the region as these projects will generate 7000 million units of electricity annually. The state government will also benefit as it will receive about 800 million units of power free of cost as royalty. The additional power will to a large extent offset the loss of revenue due to a sharp decline in rates of power. The situation turned tense when Education Minister ID Dhiman arrived for attending the annual distribution function and inauguration of the science block in the college and the protesters carrying placards raised slogans. The protest irritated the supporters of the minister and ABVP activists which resulted in a clash between the two groups. According to witnesses, the NSUI protesters which included a girl activist were assaulted during the clash. The NSUI activists were forced to go out of the premises by the police. Sub-divisional police officer, Dehra, Paras Ram said a heavy police deployment was made in the college to avert any major incident. The NSUI students, who were in a small number, carrying placards raised slogans and a clash took place. But timely intervention of the police saved the situation from taking any ugly turn. Paras Ram said later on, the annual function of the college continued and the minister also inaugurated the science block. He said no case was registered in this connection and no arrest was made. Minister for Food and Supplies Ramesh Dhawala, who represents the constituency, was also present on the college premises when the students clashed. NSUI leader Neeraj Kumar said they were demanding the appointment of the principal in the college. Besides the government should take over the college and provide better infrastructure in the larger interests of students. But the protest was resented by the supporters of ruling party resulting in assaulting and beating up of NSUI activists, including Bhavna Kumari. PCC chief Kaul Singh and Congress leader Nardev Kanwar condemned it and demanded a high-level inquiry into the incident. He demanded that the police should register a case against them. Dr Rupali, talking to The Tribune, said the study was based on a theory that automobile exhaust contributed significantly to air quality problems. Road traffic produced volatile organic compounds like suspended particulate matter (SPM), oxides of sulphur, oxides of nitrogen and carbon monoxide which makes adverse health effects on the exposed population. The health problems include asthma, bronchial hyper responsiveness, aggravation of existing respiratory and cardio vascular disease, alterations in the body defence system, damage to lung tissue and even carcinogenesis. The study was conducted on three groups of traffic policemen of Himachal, including those working at an altitude below 4000 feet, those working above 4000 feet and control group of non-traffic policemen. 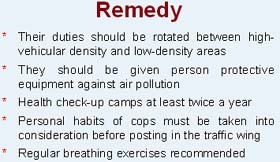 The basic aim of the study was to evaluate spirometric parameters in the traffic police situated in Himalayan regions. The evaluation of data collected in the study revealed that the traffic police working below 4000 feet altitude had higher value of spirometric parameters than those working at higher altitudes. Apart from this, 10 per cent of the traffic police were affected due to air pollution. Dr Rupali has suggested that to minimise the health hazards to traffic policemen, their duties should be rotated between areas that have high and low vehicular density. 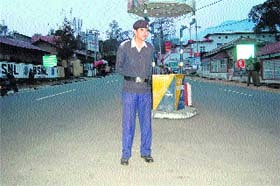 The duty of traffic cops should be rotated at least once every six months despite administrative inconvenience. She has also advised that the traffic policemen should be given person protective equipment against air pollution such as nose mask or filter mask. Health check-up of traffic policemen at least twice a year particularly spirometric evaluation and lung function tests are necessary for early detection of restrictive lung disorders. The personal habits of police personal must be taken into consideration before posting in the traffic wing as smokers have more risk of developing obstructive lung disorders due to automobile exhaust than normal healthy individuals, the study states. It has also suggested that regular breathing exercises should be recommended to all traffic policemen. The study also recommends that the Himachal Police should join hands with NGOs to organise continued programmes of check-ups, diagnosis and treatment of traffic cops with likely respiratory and other ailments. The Irrigation and Public Health Departments have failed to follow the norms fixed by the government for laying water supply pipes, therefore pipes were leaking and directly affecting the PWD roads of the town causing inconvenience to the public. In many roads it is difficult to drive vehicles. As per norms notified by the state government, the minimum depth of pipes should be one foot but these norms were openly flouted by the IPH Department. There is none in the IPH Department to check the leakage of pipes. Roads leading to Bundla, Sugar, Aima and Lohana are worst-affected where water is flowing openly on the roads. At the Neugal chowk, around six water supply pipes were leaking and the road had developed big holes. A road leading to the house of IPH Minister Ravinder Thakur, which was repaired three months ago, has again been damaged at 10 points because of the leakage of pipes. Because of leaking pipes, in Sugar, residents of Aima, Bundla, SSB Chowk were forced to use contaminated water resulting in various diseases like jaundice, hepatitis and other water-borne diseases. Local residents have brought the matter to the notice of the IPH authorities time and again but no steps were initiated to repair the road. Suresh Mahajan, executive engineer, IPH, expressed his ignorance and said he would look into the matter. Enquiries made by The Tribune revealed that Public Works Department has written six letters to the IPH authorities in this regard in the past six months, but no efforts were made to repair the leaking pipes. The leaking pipes were not only causing loss to the PWD, but the water was also being wasted. Stating this here today, national convener of the party’s central cooperative cell Dhananjay Kumar said the proposed amendments in the Act would undermine the autonomy of the cooperative institutions and increase government interference in their functioning. Similarly, the move to impose income tax on income exceeding Rs 20,000 would further weaken their financial position and small cooperative societies might perish. The sole purpose of these moves was not to strengthen the cooperative sector but to merge multi-state cooperative societies into other business entities as provisions had been included in the Draft Amendment Bill to facilitate transition of societies from the Cooperative Act to the Companies Act. It would defeat the basic purpose of the cooperative institutions, which were set up to strengthen the rural economy. Big companies and corporation were only interested in making profits. The amendments would allow the registrar of cooperative societies at the Centre and in the state to interfere in the administration of cooperative societies and merge the multi-state institutions into other business entities at will. Further, income tax will be charged at 30 per cent for income exceeding Rs 20,000, which will stifle these societies financially. The BJP would organise a protest rally at Delhi on March 7 to oppose the amendments as the relevant Bills were likely to be introduced in Parliament during the Budget session. Besides, about 30 party MPs, who were associated with the cooperative movement would raise the issue inside the House. Joining issue with the HPSEB Project Engineers Association, it pointed out that after unbundling, the scenario had totally changed now and the Himachal Pradesh Power Corporation Limited had been entrusted the execution of new hydro projects, whereas state transmission utility was looking after the work of infrastructure required for evacuation of power from upcoming project. HPSEB Limited was now responsible for maintaining, operating the existing generating stations and power supply to different categories of consumers. Further, as almost all ongoing projects pertained to high voltage or low voltage distribution systems, it was illogical to appoint a civil or mechanical engineer to monitor these projects. Similarly, one post of chief engineer in Energy Directorate, which is now looking after the functions like evaluation, monitoring and granting techno-economic clearance and sale of power which were earlier handled by the board, should also be manned by an electrical engineer. The interest of the state would be served well only if the right decisions by the professionals was taken. The office of chief engineer, planning and monitoring, is the technical think tank for judicious planning and monitoring of works which are electrical in nature. The core mandate with HPSEB Limited is maintenance of existing power houses, execution of the hydropower projects up to 25 MW, distribution of power and maintenance of associated transmission system and distribution network to ensure quality power. The monitoring of works under central schemes like RGGVY and R-APDRP is also the domain of electrical engineers as 95 per cent of its functions are electrical in nature. As many as 164 skiers drawn from all over the country, including ski teams from the Army and the ITBP, were participated in the skiing championship. Besides, skiers from SASE, Jammu and Kashmir, ABVIMAS, Manali and 17 different ski clubs of the state were also participated in the skiing championship. The concluded function was presided over by MLA Govind Singh Thakur. 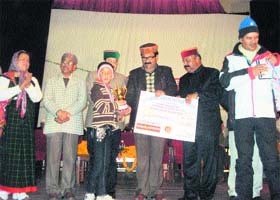 He distributed the prizes to the winners at Harnam Singh Auditorium at ABVIMAS, Manali, last evening. Results: Alpine race (giant slalom) Boys: Kirti Karishn, YMWSC, Palchan, 1, Ujwal Negi, HSC, Narkhanda 2, Abhishek Thakur, Ski Himalayas, Solang 3. 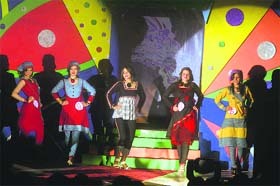 Girls: Urwashi Thakur, ABVIMAS, Manali 1, Urlisha Thakur 2, Yashika Kanwar, HSC, Narkhanda 3. Alpine race (giant slalom) for sub-junior girls and boys. Girls: Promila, MSA, Burua 1, Sandhya, YMWSC, Palchan 2, Anuja Thakur, NYSC, Solang 3. Boys: Satya Kainthla, HSC, Narkhanda 1; Alwyn Kanwar, ABVIMAS, Manali 2, Anil Chand, NYSC, Solang 3. Junior boys: Chander Sethi, YMWSC, Palchan 1, Narayan Thakur, NYSC, Solang 2, Rohit Thakur, YMWSC, Palchan 3. Junior girls: Sonia Thakur, MSA, Burua 1; Urvashi Thakur, WSC, Vashisht 2. Giant Slalom (Men): Santosh Thakur, YMWSC, Palchan 1, Heera Lal, MSA, Burua 2; Bhan Bhadur Gurung, ASCB 3. Giant Slalom (Women): Pooja Thakur, ABVIMAS, Manali 1; Urmila Thakur, NYSC, Solang 2; Suman, YMWSC, Palchan, 3; Snow board (Giant slalom) Modasir Ahmad Bhat, Jammu and Kashmir 1; Ranjeet, WSC, Vashisht2; Amit Thakur, Adventure club, Burua 3. Giant slalom (Women): MS Dindy, WSC, Manali, (special prize). Country Skiing: Chhaminder 1, Suresh 2, Prem Chand 3. The Chief Minister sanctioned Rs 1.20 crore for major and petty development works, medical and other financial succour to the poor and needy people of the area on the occasion. According to official information, the Chief Minister sanctioned Rs 27 lakh as the second instalment for the ongoing construction of the Wazir Ram Singh Pathania Stadium, Fatehpur. Much to the surprise of the tourists and general passengers, none of the Himachal Tourism and Himachal Tourism Development Corporation (HPTDC) offices in this district know about the heli-taxi booking system. Tourists, who were trying for the bookings, got disappointed and approached travel agents in Manali, but to their astonishment the travel agents in Kullu and Manali were also ignorant about the operations. Everyone said they had read it in newspapers and nothing beyond that. This correspondent spoke to tourist information offices at Kullu and Manali and found that none of the offices were having any information about the bookings. Both departments were giving each other’s telephone numbers confirming that they had no knowledge of the booking system. District tourism officer Rajeshwar Goel said the bookings were being done by operators and one had to contact them either in Shimla or Ludhiana. But telephone calls of the operators were not answered. The government seems to be indifferent in promoting tourism as the national career has never increased the number of flights and now the heli-taxi services are also proving to be a failure. In a pre-budget memorandum, the confederation has urged the Union Minister to re-introduce the standard deduction, which was withdrawn in 2004-05 to provide relief to the salaries class, which was reeling under rising prices. Further, for the women employees the exemption limit should be raised to Rs 3 lakh from the existing Rs 1,90,000. The withdrawal of standard deduction was quite discriminatory as it took care of the day-to-day conveyance and other miscellaneous expenditure as was allowed to the business community. The limit of standard deduction should be Rs 50,000 per annum. Since the dearness allowance was given to neutralise inflation, it should be exempted from income tax. “Twentyfive per cent direct recruitment will reduce the promotional opportunities of the TGTs possessing postgraduate degrees whether they intend to be promoted as lecturers or headmasters,” he pleaded. Rana also claimed that this step would also affect 50:50 ratio fixed for the promoted and direct lecturers. Apart from this, the promotion of headmasters and lecturers would also be delayed. The State Vigilance and Anti-Corruption Bureau (SVACB) found the forest field staff lax. The illicit timber was cut from the Khani forest beat, then sawed and was converted into sleepers, all under the nose of the forest staff. SP, Vigilance, Virender Sharma said, “We are interrogating the six persons arrested under the Forest Act and the IPC on Friday. We found that the forest staff remained a mute spectator and ignored surveillance in the area”. He asserted that the Vigilance would fix the accountability of all monitoring forest staff in the case. The Forest Department had failed to check that the violators were converting timber at will, observed the Vigilance. Investigation found that 281 deodar sleepers were cut from the Thachi forest range in the Nachan forest division. On the other hand, DFO, Nachan forest division, SS Patial, said he visited the spot yesterday and instituted a departmental inquiry under the ACF. The bureau said Rohit was arrested when he was about to board a bus en route to Dehradun and seized jewellery that was in small packets of plastic containers. Rohit informed the SVACB that he was an employee with a jewellery company in Karol Bag of New Delhi. The SVACB handed over the matter to the Excise and Taxation Department for tax evasion matter. It is said that at least 25 per cent tax, including a fine will be imposed on him under the department norms. The camp was held with the assistance of the local Guru Ravidas Temple Committee and the Sant Ravidas Dharma Sabha.